#1.2 10 Best Case Trimmers on the Market Right Now! 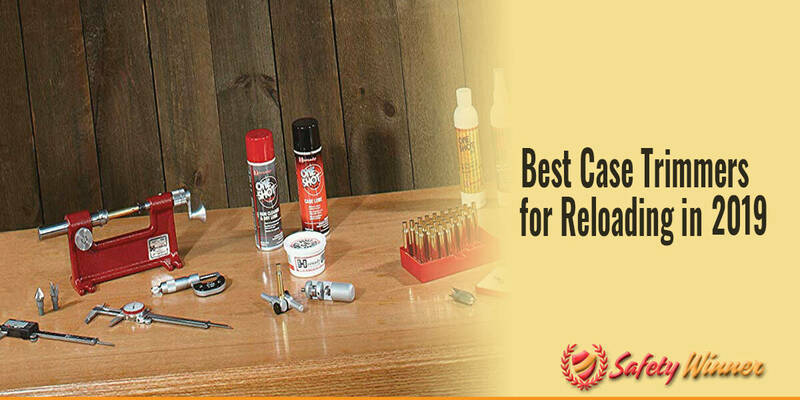 Most gun enthusiasts and hunters really enjoy reloading their own ammunition. They like the process of measuring things out, making sure that every round is accurately reloaded. This gives them the ability to create ammunition that specifically meets their needs. However, not every task in the reloading process is fun. Trimming is one of those that people will commonly tell you they don’t really like to do, but it is a necessary step in reloading your ammunition. This is why you want to make sure that this process is as enjoyable as possible so that you will keep performing the task. To accomplish this, it starts with finding the best possible case trimmer on the market, and that is what this review is all about. My goal is to help you find the very best product to assist you so that you can increase your efficiency while decreasing your frustration and how tedious this process can be. Why you need a case trimmer? Do I need to trim every case? How to use a case trimmer? How do I set up the trimmer the first time I use it? What should I do if the case is too big for the case holder? How to keep out my case trimmer from rusting? Case Trimmer Buyer’s Guide : How to Make the Perfect Choice? Before talking about specific products, I wanted to first address some important factors that will help you to determine what the best trimmer to purchase is. Here are some criteria to consider. Cutter Material. This should be the primary factor in determining which case trimmer you desire. Most will have a basic steel cutter, which will do the job effectively. However, there are some brass options out there which aren’t nearly as hard. If you are intending to do high-volume reloading, you may want to look at something harder, maybe even carbide. Manual vs. Electric. It is a little more difficult to use a trimmer than you may have thought, especially if it has a small crank that you have to turn repetitively to get it to work properly. If you are a person who is doing a number of rounds consistently, you really may want to look at choosing an electric option to save yourself from becoming fatigued. Durability. The quality of the product is important as well. Consider the fact that this is a tool that is designed to perform a specific task and to do it with great efficiency. You want something that is going to have a durable construction and be able to handle the workload. Accessories. Accessories are always a nice feature to have with any product you purchase, and that is true of the case trimmer is well. Some come with a replaceable cutter, dies, or other tools. If you are a person who is looking to trim many different caliber rounds, finding one with accessories that can handle a diverse load is really in your interest. Price. If we are realistic, you have to admit the price is always a concern. You want to get something that fits within your budget, but something that also works effectively. The truth is that if you can spend $25 more for a higher grade quality trimmer you should be willing to do so. Top 10 Case Trimmers on the Market Right Now! Now that you have had a chance to review some of the main criteria for choosing a good trimmer, here are some of the products that I have found to be the best. My evaluation has come through actually trying each one of these products as well as others that did not make the list, as well as reading a number of reviews about each one. I wanted to make sure that my list was something that you could count on to be accurate and helpful. Before moving on, I do want to address one important factor. I know that when I have read reviews online that I am always wondering who it is behind the keyboard. What it is about that person that would make it so that I would trust their opinion about anything. I am sure as you came across this review that you had the same kinds of concerns. You don’t know me. You may have concerns that I am being paid to write this review or to support a specific brand, and let me assure you that this is not the case at all. I have written reviews of different products before related to reloading, and I have done this primarily because, in my nearly 5 decades of being an avid marksman and hunter, I have had the opportunity to try all kinds of different products and see which ones really work best in the reloading process. This is why I wanted to spend a little time writing an article related to the best trimmers out there. This is one of the best case trimmers you are going to find on the market. 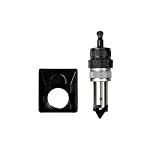 It does virtually anything you could desire terms of trimming and can handle virtually any kind of trim and chamber job for any kind of cartridge, all the way from a .17 all the way up to a .460. This means that just about any kind of cartridge you have can be taken care of by this device. 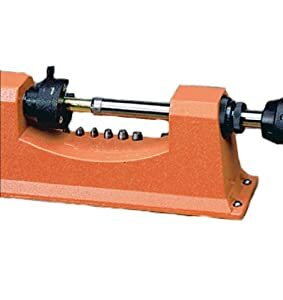 It is important to note that it is not built for straight walled cases that you would find in pistols or in some specific types of rifles, but any other cartridge can quickly and easily be handled by this trimmer. I like the fact that it was an electric unit, which meant that I got the same kind of power and efficiency with each use. There is no need for a shell holder and the trimming and chamfering processes are done quickly and accurately each and every time. This is a durable device that can handle thousands of rounds at a time because of its heavy duty motor, and the drivetrain that is used. Both are made to give you great durability and performance, making it one of the very best that you can find on the market. Plus, it includes a storage space built into the device where additional tools can be held. When you purchase this Frankford product, you receive a whole series of tools with it, including a deburr, chamfer, a pocket cleaning tool, and three collets as well as shoulder bushings. This is truly a remarkable product that makes sure that everything you need is right there. This is a fantastic manual trimmer, which is built with the highest quality steel, ensuring you get an efficient trimming each time as well as great durability. It is built to provide great stability, so you can operate it without worrying about trying to gain control while using the handcrank. I found the way that the center of this trimmer was designed was done with great engineering efficiency, making sure that it enabled me to create a good finish. Plus, it is built so that you can clamp it to a table or screw it in place to provide even greater stability. This case trimmer comes with an ergonomic handle, which is perfect for both left and right-handed persons. That makes it easy to use for prolonged periods of time without feeling discomfort either from the handle or the action of the trimmer. Included is a secure cam lock that makes it easy to lock or unlock the cam with a simple touch. This locking mechanism allows you to have easy control over the loading and the management of the case lengths so that there will be no variation. Included in the package are seven different pilots, measuring from 22 caliber, 6 mm and 7 mm, 38 caliber and 45 caliber. This makes it so that you can use the product with virtually any caliber round, as the manufacturer guarantees that you should be able to use it with up to 50 different calibers. This Lyman universal case trimmer comes with a universal chuckhead that makes it so that you can trim cases that range from .17 all the way up to .458 caliber. This eliminates any need that you would have for shell holders or collets, saving you money and time. It is intelligently designed and efficient so that you can hook it up to a power adapter, allowing you to either perform the trimming manually or through the use of a power outlet. Using the power outlet allows you to trim up to 250 cases per hour. A pretty remarkable value. You are able to set both the fine and coarse adjustments to as precise as one-one-thousandth of an inch. Included is the ring dial adjuster that makes it an even easier product to be able to use. You receive nine pilots that assist with such caliber weapons as 22, 9 mm, .357, and .45, among others. The chuckhead was a particularly great touch. This made the use of this product a whole lot easier, plus it made it so that the dialing of the adjustments was more precise. The handle is designed to be comfortable for prolonged periods of times in the fact that you can set specific links made it a great choice. 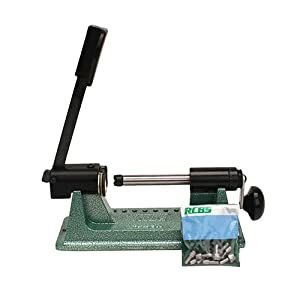 If you are a person who does a lot of reloading on your own, then you are likely familiar with the RCBS products already. They make an outstanding line of quality reloading products, and this one is no exception. It begins by the fact that it comes with a spring-loaded shell holder which not only makes the process quick, but also holds securely the case in place so that no shell holder is required. This kid is ideal for those who are using all forms of standard pilots, as nine of the most common are included in the kit. An ergonomic cutting handle is included that easily extends to make it easier for you to be able to turn. Plus, it is built to either work perfectly with a left or a right-handed person. I will not lie in the fact that the price is a little more expensive in comparison to other models, but it is built of a fantastic quality steel, ensuring that you’re getting optimal quality. You will find that this is the kind of product that you will have for years because of how durably built it is. You can easily mount this to your workbench and it is extremely easy for you to be able to use. No matter what your level of experience is, you are not going to have any challenge in using this product. Some will tell you that they prefer a basic case form of trimmer, and this is a great option. Because of its size and design, you can trim any case up to .458 caliber, and it uses the standard size shell holders, which is a nice touch. In many different trimmers you are required to buy a shell holder that is specifically designed by the company, but not with this Lyman product. It can handle virtually any rifle or pistol case, and provides an accurate trimming with each turn. Included is both a fine and coarse adjustment that allows you to quickly change by a little turn of the dial. Plus you can use this to set the trimming length, giving you much greater control during the trimming process. Lyman Universal Trimmer, Unboxing and Review. This trimmer does not require collets and comes with nine pilots. This allows you to trim a diverse number of calibers, because you have all of the equipment right at your disposal. Plus, this is one of the easiest trimmers you will ever have in terms of set up and use. The only real concern about it is that it requires you to continually turn the handle, which can get pretty tediousif you are doing a number of rounds at one time. I also found that the case clamping mechanism is one of the quickest and easiest to use while still providing you incredible consistency. Many would tell you that this is the absolute best case trimmer for the price that you pay. That’s a pretty fair assessment as this is a product I really thought set itself apart from many of the other ones of similar quality. It starts with the fact that you can quickly convert the Universal trimmer into power trimming in a matter of just a few seconds. 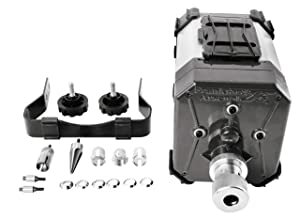 This is easily done by replacing the existing shaft with the power adapter shaft and drill, so that in just a few brief moments you can perform different tasks. The power trim allows you to trim up to 250 cases in a single hour, a pretty remarkable rate of efficiency. Plus, you can be sure that each case will, with the same accuracy and consistency each time. All of the hardware that you need to convert this trimmer comes with the kit, saving you money. Plus, there are easy instructions to follow which ensure that it will take you just a few brief moments to get your trimmer converted. The product is made of a durable material, ensuring that you will get longevity out of this, plus the handle is easy to turn and is ergonomic, easily workable for both left and right-handed people. You can easily screw it into your workbench and thus it will provide greater stability. However, it works quite effectively as a standalone machine. This is one of the more unique looking trimmers on the market. This is a cutting jig that comes with a high impact plastic guard that can handle the 300 blackout as well as cases that are similar in length. This is an affordable option that should fit in the budget of anyone, it still gives you a great deal of precision for the case of choice. If you are a person who has a .223 or a 5.56 cartridge, or some similar size choice, you can get an accurate cut off and ensure that the neck is perfectly plummed to the cartridge bottom with each use. This will give you a precise alignment each and every time. You can be sure that each and every time you will get the proper case length created. The precise cut is created because of the tapered bed, ensuring that the cartridge is properly aligned and that it cannot shift during the operation, causing the cartridge to be out of alignment. Plus, this is an incredibly durable product made with quality materials. The plastic guard assures that it does not interfere or injure your hand, and it can be removed if you find that it is unnecessary. What a great product to simply slip into your pocket or into the pocket of your bag and take with you. Before ending this review, I wanted to address some of the more common types of questions that I am asked by people. I thought this would help you to make more informed decisions and have a better understanding related to trimmers. #1 Why I Need a Case Trimmer? The purpose of the case trimmer allows you to trim your cases so that you are able to reuse them. This allows you to save money and create rounds that are generally more accurate than the ones you would purchase at the store. #2 Do I Need to Trim Every Case? The answer to this is no. It should be done on a regular basis, but that can be as regular as every two or three times that you reload. That should be sufficient enough. #3 How to Use a Case Trimmer? Because some trimmers are different than others, here are some general guidelines on what you should do. Begin by mounting the case trimmer in place. Some have options that allow you to screw it directly into your workbench, or you may have to use a vice, reloading press, or clamps to accomplish the task. When doing this, ensure that there is enough space to be able to work and that the bench is stable in its location. Load the case into the case holder and make sure that it is flushed. Move the cutter shaft in the direction of the case holder and tell the cutter is located against the mouth of the case. While holding the cutting knob, turn the cutter in a clockwise manner until the case is finished. The trimming has been accomplished when the guide and the bushings come in contact. Remove the trim case and then finish off the case using the chamfer or debur tool. As a quick note, make sure that you lubricate the trimmer on a regular basis, at least after using it 300 times. Also check your fine adjustments on a regular basis. #4 How Do I Set Up the Trimmer the First Time I Use It? This is a little more complicated answer than you would think. Because every trimmer is a little different, the best thing that you should do is to review the guide that came with your case trimming product. This should give you instructions on exactly what you need to do, including how to mount the product properly. #5 What Should I Do if the Case is Too Big for the Case Holder? If this is the case, you have one of two options. If the trimmer allows you to use larger size case holders, then you may have to purchase a different sized case holder to be able to handle the trimming process. You may also have to consider the fact that your trimmer may not work for that size case. This will likely require you to purchase a different product to be able to complete your trimming. #6 How to Keep Out My Case Trimmer from Rusting? Rust is created when humidity or water come in contact with metal. The best thing that you can do to prevent this from happening is to properly store your device in a location that is low in humidity. If you have a gun cabinet, this would be an ideal place. However, many people install their case trimmer to their workbench, meaning that they can’t simply take it out and put it away. In this case, you need to do two things. First, there are gels and oils that you can purchase that you would place a very light film over the entire product. This acts as a barrier to keep moisture from being able to get on the trimmer. Also, regularly wipe down the trimmer so that humidity does not have a chance to build up. This should be done daily. How to Weigh Powder on a Reloading Scale?